I have found myself on the morning school run with 'The Happy Kombi Family'. I don't know them, nor do I know if they are truly happy, but the picture they present from where I sit certainly looks like a happy one. Every morning for the past 2 weeks I have bumped into them on the way to school. Not like literally, I'm not that bad a driver. There is usually a car or two between us or sometimes they are going in the opposite direction, but every time I see them I get excited and grin from ear to ear. 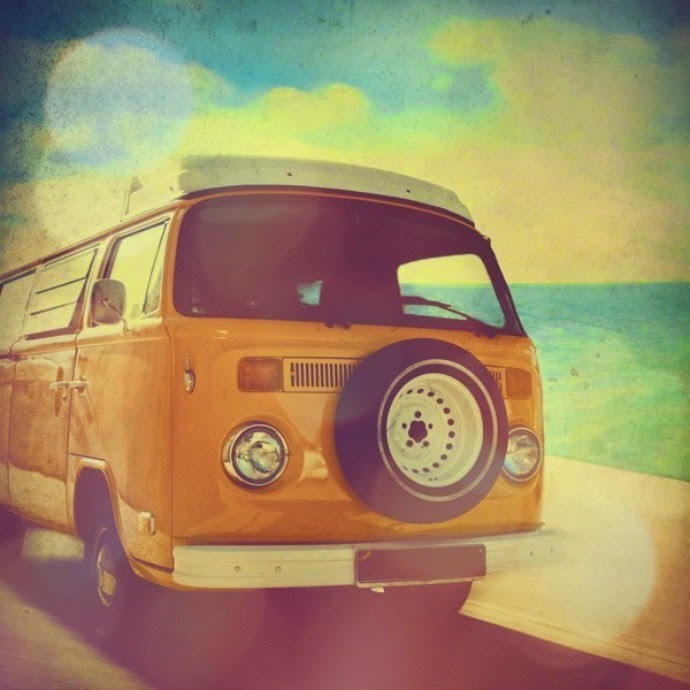 They travel in a bright orange and white Kombi van complete with a rainbow sticker on the rear window. In the car is Mum driving, three young kids and a Golden Retriever sitting on a seat in the back of the van with the kids. The kids wear their school caps so I can't really tell if there is a mix of boys and girls, but there is definitely two girls among the three because I have seen their pony tails. I can't explain what it is about this family that makes me feel the way I do when I see them. I really can't. But the kids always seem to be chatting to each other in the back and laughing, the dog sits up and looks out the window, the Kombi's colour is just so bright and cheery and so the whole package just oozes happy. Of course I don't know their story or whether their life is as sunny as it looks from an outsider's point of view. But I do hope it is, because just seeing them makes me feel happy so I figure they deserve to be as genuinely happy as they look. I have to admit that there are some days that I get a pang of envy when I spot them. Especially if my kids have been particularly turdish that morning. But then on other days, driving behind them makes me suddenly miss my boys only moments after I have dropped them off at school, so much so that I want to turn the car around and go pick them up again just so I can hear them laughing in the car with me. This family is the ultimate real life advertisement for Kombi vans. They totally inspire me to go out and buy us a kombi and load our dogs into the van every morning for the drive to school. Most of all they just make me smile and remind me just how awesome it is to have a family of my own to travel with. Who knew a random family could have such an impact on me. They have no idea I exist, or just how excited I get when I spy their van in their traffic but just in case there is a one in a zillion chance the mum of 'The Happy Kombi Family' is reading this - I just want to say thank you. Thank you for adding a little extra happy into my mornings. EDITED UDATE: I just had to let you know that not long after I posted this I received an email from a friend who tells me that 'The Happy Kombi Family' are friends of theirs and in fact I went to school with 'The Happy Mum's' older sister. Small world huh! I have been told that the family's van is actually called Happy and that they are every bit as happy and gorgeous as they seem and I gotta tell you this makes me very happy indeed. I will continue to enjoy bumping into them in traffic and I will smile even bigger now knowing that they are the ultimate happy family I imagined them to be. The picture is even more perfect now! Do you drive past anything or anyone on a daily basis that makes you smile. Have you ever spotted a family unit that just makes you feel... happy?